An amazingly open, three-dimentional, harmonically rich sounding preamp designed for use with tube, ribbon, and dynamic mics - any non-phantom powered mics - as well as bass and all other low level instrument direct-in applications. Last month, Art for Art, Inc. presented the 15th annual Vision Festival, which is a multidisciplinary arts celebration renowned for its support of innovative jazz music. The live music event took place at the 600-seat Abrams Art Center and featured an appearance by legendary German tenor saxophonist Peter BrÃ¶tzmann. Amidst the saxophones and experimental jazz sounds, Stefan Heger, Vision Festival's chief recording engineer, was situated in the stage wings manning a mobile studio that relied heavily on TRUE Systems Precision 8 microphone preamplifiers to deliver transparent, detailed sound. 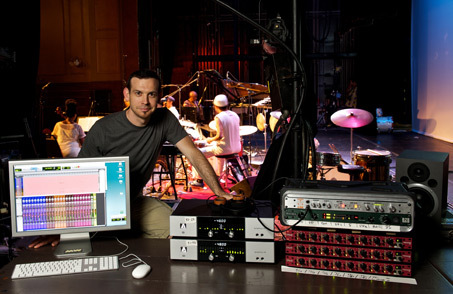 Heger has served as the Festival's live recording and mixing engineer for the past 10 years, during which he has used a variety of mics, mic preamps, converters and software. In addition to the True Precision 8 mic preamps, this year's mobile studio at Vision involved using Avid Pro Tools 9, Mojave microphones, Apogee converters and a BURL A/D converter. 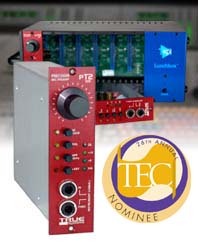 Heger says he was pleased at the performance of his TRUE Systems preamplifiers, which handled everything from horns and reeds to strings and percussion: "For the second time in a row TRUE Systems mic pres delivered absolute pristine sound and a clear working environment, allowing me to see and adjust levels on the go." His Precision 8 preamplifiers were feeding two Apogee Symphony I/Os, providing 32 channels of native ProTools at 24 bit / 48KHz. "Live Recording and mixing at the same time has never been more efficient," Heger says. Ease of use is among the top considerations in a sometimes chaotic recording environment. "I am essentially in a small space in the middle of all this craziness, which makes it very challenging to create a studio-like atmosphere," Heger explains. "It's important for me to keep the signal flow as short as possible and the Precision 8s allow me to do just that--it's basically microphone to mic pre to converter and you're done!" Over the years, Heger has used many competitive microphone preamps, but for the Vision Festival, kept coming back to the TRUE Precision 8s. "For me, great sound and ease of handling in a live situation is crucial," he says. "I don't use a live console since there are too many features on it that I don't need for recording. With the Precision 8s, I can set the peak LED, which is critical since I am leaving my spot often. I also appreciate the overall design for this application, since the numbers and knobs are easy to see and access, and wiring with the Sub-D connectors is quick and easy." "I was always searching for the perfect microphone preamp for The Vision Festival and I finally found it," Heger concludes. "I came back to the Precision 8 not only because I knew exactly what to expect, but because it simply does the best job on all the instruments." Heger has returned to his home base in Cologne, Germany, where he will be mastering the Vision Festival Recordings for public release Fisheye Music, his surround sound mixing and mastering studio. 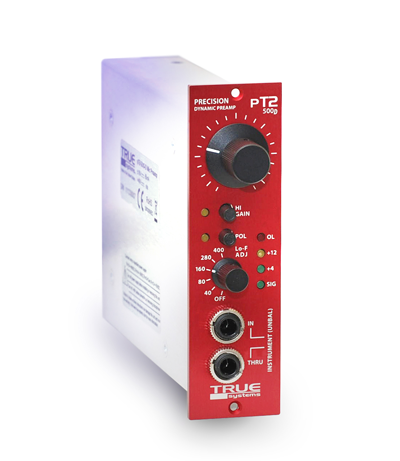 Our new Type-2 design gives this ultra-resolution preamp all the detail of our other models, with serious analog depth and warmth. It’s a fresh new color of TRUE. "The P-SOLO Ribbon, which comes in at well under $700.00, is performing at a level that's comparable to mic pres that cost five times as much." "It's all about standing on the front line of where music is today and capturing the band's true sound with TRUE mic pres." "The Neumann and the P2 Analog is the perfect combination to make the piano sound like it should." "The Precision 8 is very transparent sounding and very accurate. It's an excellent piece of equipment." Marc Fuller, Grammy-nominated for Kanye West’s "College Dropout"
© 2019 TRUE Systems | TRUE Systems is a division of Sunrise Engineering and Design Inc.